Notre Dame welcomes the SEC to South Bend as Georgia makes their first ever trip to Notre Dame. Both teams are coming off relatively easy wins in their opener. The Irish defeated Temple 49-16 while the Bulldogs downed Appalachian State 31-10. Last week displayed a bruising running game led by Josh Adams’ 161 yards and two touchdowns. Quarterback Brandon Wimbush 17-30 from two touchdowns and an interception. One can only imagine the Bulldogs defense will be focused on shutting down Notre Dame’s powerful run game. Dexter Williams added 124 yards and Brandon Wimbush had 106 himself on top the 161 by Adams. Georgia comes into the game with a major injury at quarterback. Jacob Eason left last week’s game with a sprained knee and will not be available this weekend. In steps Freshman Jacob Fromm. Fromm finished 10-for-15 for 143 yards and a touchdown last week. It has to be a concern that the Irish offense got very inefficient after jumping out to a 28-3 lead. It is natural for a team to relax a bit when dominating but playing 60 minutes will be needed to beat Kirby Smart’s Bulldogs. The offense got sloppy at times and the defense struggled at times with tackling. 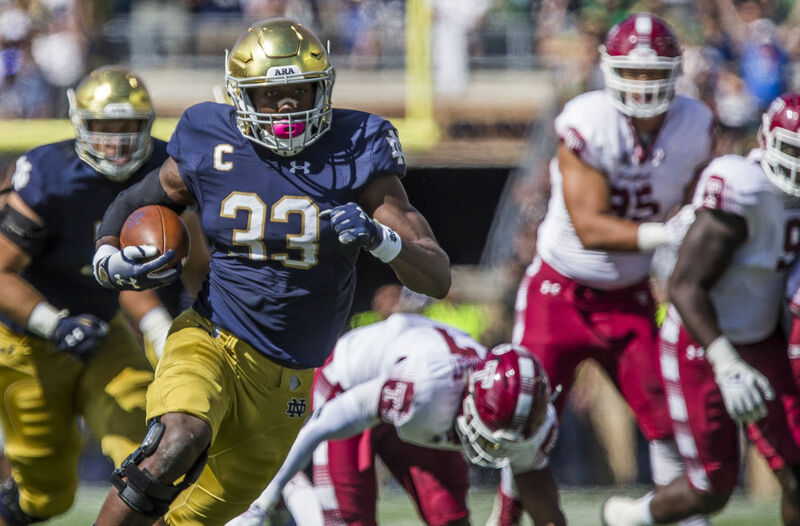 Notre Dame’s struggles from last season resurfaced, even in a blowout win over Temple. The Irish running game will need to control the clock. When Notre Dame fell behind the chains, they struggled on offense. If the Irish defense tackles poorly, Nick Chubb will a big day. Last week, Chubb went for 96 yards on 15 carries. Sony Machel went for 87 yards on 16 carries. The two headed monster will be a handful. Ultimately, the Irish are at home with every bit of motivation. Their offense will control the tenor of the game. Control the clock and stay on schedule and it’s a win. A lot of second/third and longs and poor defensive technique and the Dawgs will leave with a victory. QB Brandon Wimbush became just the fourth Irish QB since 1985 to be responsible for three or more TDs in his first start. Georgia’s Andrew Thomas started at RT becoming the first true freshman lineman to start since John Theus in 2012. Chubb ranks fifth nationally in career rushing yards among active players with 3,520 while Michel is 15th with 2,498.